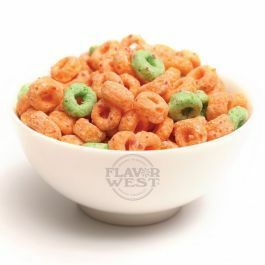 Apple Jacks type flavor has an intense apple characteristic which creates the reassurance of that sweet apple flavor taste. Type: Apply jack type Water Soluble Flavoring. Ingredients: Natural and Artificial Flavoring, Propylene Glycol and Ethanol. USP Kosher Grade Flavoring. Usage Rate: 15-20% for E-use. Flavor suitability: Desserts, pastries and baked treats, yogurt, ice cream, candy and more. Specific Gravity: 1.05 No Refunds on Flavoring.